Share the post "Support the Campaign: Action Centre"
Share our blog posts – comments and ‘likes’ improve our visibility on social networks and search engines. Invite others to view our site and social media pages. You can also share our site on Google Plus (click to share) or LinkedIn (click to share). Download a QR code poster, a QR code sticker sheet or a poster to put up in your neighbourhood, building or workplace. Or download a bilingual protest placard for use at the next rally or protest gathering. Volunteer: Some NGOs, such as Bethune House and Pathfinders, welcome volunteers. Are you a professional photographer or videographer? 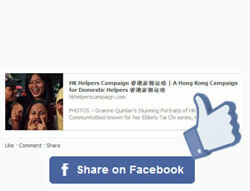 Join our team of volunteers at the HK Helpers Campaign and pitch your ideas. Please drop us a line if you can help us raise awareness of our campaign points and make the issue go viral. Could you translate for us? Are you familiar with the issue and are able to speak/write Traditional Chinese, Thai, Bahasa Indonesia, Urdu, Bengali, Burmese, Sinhala or Tagalog? Please contact us if you would like to volunteer as a translator for our campaign. Are you a journalist or writer? Visit our media centre and contact us if you would like more information. We are hoping to gain local and international coverage and can put you in touch with sources. Are you a legal professional? 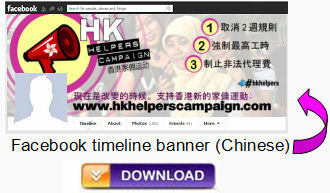 HK Helpers Campaign is working closely with our human rights lawyers who are keen to challenge domestic helper injustice. Please contact us if you are interested in pursuing our campaign points through the courts. Contact HK’s leader. Email the Honourable Leung Chun-ying at ceo@ceo.gov.hk, telephone 2878-3300 or fax for free via Outfax at 2509-0580. Or write to him at Office of the Chief Executive, Tamar, Hong Kong. Contact the Equal Opportunities Commission chairperson. Email Dr York Chow Yat-ngok at eoc@eoc.org.hk, telephone 2511-8211, or fax for free via Outfax at 2511-8142. Or write to 19/F., CityPlaza Three, 14 Taikoo Wan Road, Taikoo Shing, Hong Kong. Contact the Director of Immigration. Email FAO Mr Eric Chan Kwok-ki at enquiry@immd.gov.hk, telephone 2829-4141 or 2829-4142 or fax for free via Outfax at 2827-0662. Or write to Chief Immigration Office, Immigration Tower, 7 Gloucester Road, Wan Chai, Hong Kong. Contact the Commissioner of Police. 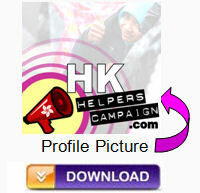 Email Mr Tsang Wai-hung, Andy at cp@police.gov.hk, telephone 2860-2001 or fax for free via Outfax at 2865-6546. Or write to FAO Mr Tsang Wai-Hung, The Commissioner of Police, 14/F, Arsenal House, Police Headquarters, 1 Arsenal Street, Wan Chai, Hong Kong. Contact the Money Lenders Association chairman. Email Akihiro Nagahara at chairman@lmla.com.hk, telephone 2827-8281 or fax for free via Outfax to 2827-8292. Or write to FAO Akihiro Nagahara, The Licensed Money Lenders Association Ltd, 21/F, Allied Kajima Building, 138 Gloucester Road, Wan Chai, Hong Kong. Contact a LEGCO member. Click here for a contact list (or download a PDF here). 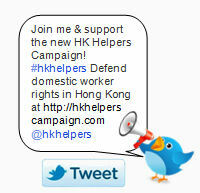 Tweet a HK journalist – tell them of our campaign and ask them to investigate injustice and abuse against HK’s helpers. Hit the streets! We are an activist group at heart – please keep an eye on our ‘events‘ blog tag and social media pages for news of upcoming gatherings. Download a bilingual protest placard and join us!